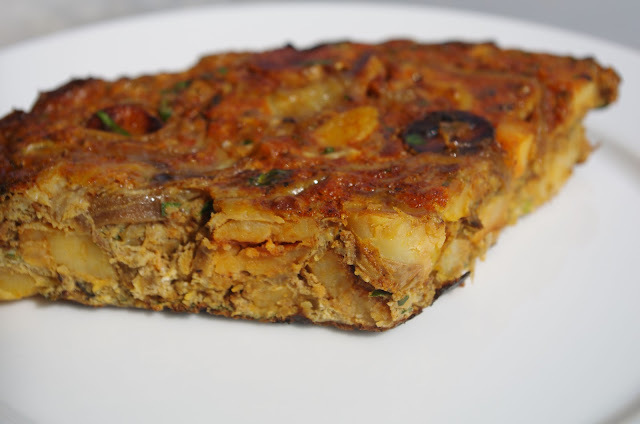 Please check out my reviews for a very easy and delicious breakfast Tortilla Espanola otherwise know as a Spanish omelette. 6 - 8 eggs whole (eggs should justcover the potato and onion mixture). COOK: In a medium to large non stick pan add 1tbs (or more) olive oil and heat, then add your potatoes. This may take a while ( you can also par boil the potatoes until they are half cooked and dry off before frying them. Toss them with s&p and some paprika - keep them moving every few minutes so that they don't stick to the pan. When they have softened up a bit - 8 mins or so add the onions and continue to cook on a medium heat until the mixture takes on a golden colour and pieces of the potato start to fall apart. Then take the pan off the heat, add the mixture to the beaten eggs and toss the parsley in as well. Add a little more olive oil to the dirty pan andtransfer the the entire mixture back into the pan on a low-med heat. Let the bottom cook for a few minutes and shake the pan a bit to get everything moving. Then place pan in the oven (*make sure your pan is oven safe!) It only takes a few minutes for the omelette to puff up and cook through. If you find after 5-10 minutes that its still gooey inside turn up the heat to the oven, or even broil for a few minutes - keep our eye on it so it doesn't burn. When the top is firm and golden its done. Cut into triangles and serve. 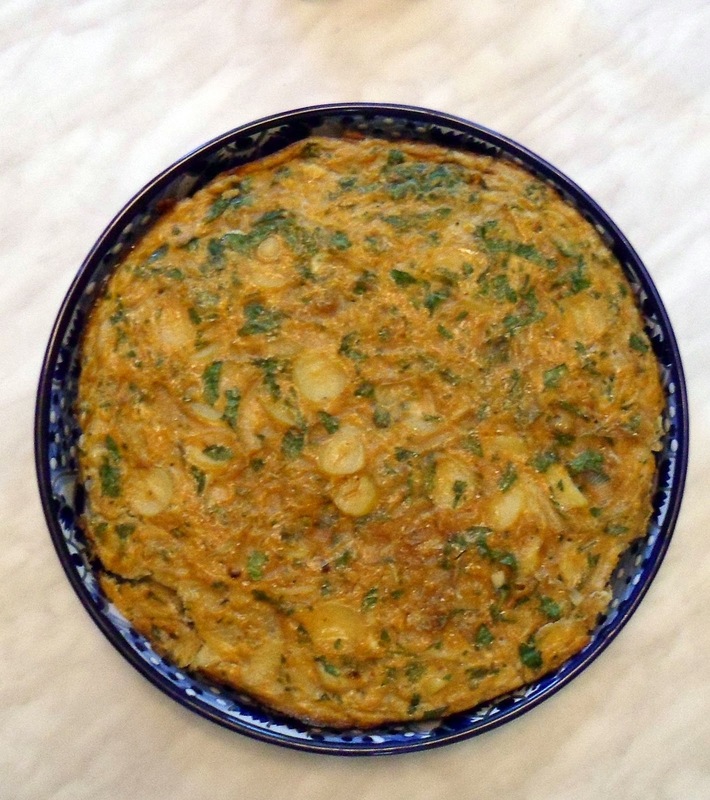 *in Spain this dish is sometimes served gooey in the center, it's you preference though. You can also serve at room temp. Paella is one of my favorite Spanish dishes. It's a rice dish that can contain mixed seafood, vegetables, beens and or meats with lots of wonderful spices aromatics and grated tomatoes. This is a seafood paella not completely authentic the famous crust on the bottom of the pan was lacking but it was delicious none the less. I enjoyed this communal dish last December on my pre wedding trip to the Riviera Nayarit in Nuevo Vallarta. We were staying at the RIU Vallarta resort which is famous for throwing theme parties. That day was obviously Spain day with a celebratory beach paella party at noon. I was delight to see rows of paella pans lined up with an intoxicating aroma wandering down to the ocean. Nothing better then eating fresh seafood while sipping a cold corona on the Pacific. I'm dreaming of my next vacation, hopefully to Spain! Fathers day is indeed a Hallmark holiday I hate buying into it, but I have to say it's one of those days you absolutely have to honor! Since I'm now a married woman I have acquired another set of parents thus another father to praise and celebrate on this glorious Sunday. We decided to do an a.m. meal with my husbands parents - a keep it simple bagel brunch where I prepared a delicious tuna salad and we picked up some Montreal Bagels from Bagel House and cream cheese obviously. I also had an awesome eggplant and tomato dish I made a few days ago that I decided to bring along (it's totally their type of dish - sort of Moroccan/Israeli style stewed salad). We also brought some Colombian pastries from Columbus Bakery on Dufferin st. the pastries or "dulces" as we call them really remind my father in law of the treats he had back home in Venezuela. Everything was delicious and enjoyed by all and I even had some of the Eggplant salad to take over to my dad's house for dinner later on. We decided to order Middle Eastern for my own father. I didn't have it in me to cook for everyone tonight and I felt bad to ask my step mom to help as her daughter just had her first child last night. A big congratulations to Justine and Aaron on their little baby girl. What a great way to celebrate a first fathers day. Getting back to dinner, I did manage to make a chopped salad/ taboule with whole wheat cous cous and wheat berries obviously not a traditional taboule. We decided to order from Me Va Me which was very good, although we all agreed the hummus had an odd creamy look and texture although the taste was pretty damn good. My sissy and I decided to keep it simple hot appetizer combo consisting of Moroccan cigars, falafel and sambusa (triangle crisp pastry filled with roasted spicy veg) hummus, tahina and scoug (hot sauce). Then shawarma, pita and garlic drenched veg along with my Taboule salad. I would definitely order from Me Va Me again! Their shawarma was very good, although my father complained he likes more crunchy dry pieces I say there was a nice balance of dry crunchy pieces and moist chickeny deliciousness. I would skip the garlic drenched veg or trade it in for some rice or potatoes since they were a bit too mushy for my liking. Hoping everyone had a happy and hearty fathers day. PREP: combine all ingredients and enjoy! Mayonnaise - always be sure to use fresh eggs with mayonnaise * raw egg warning. PREP: separate one egg discard the white. In a clean glass bowl add mustard to the yolk and start to incorporate the oil (extremely slowly) while whisking mixture vigorously. The first 30 seconds of this process is the most important to properly emulsify the mixture. Incorporate 1/2 of the oil then add lemon juice to loosen up the mixture. Add the remainder of the oil and add the vinegar if desired then add salt and pepper to taste. PREP: Pre heat oven to 350. Place cut up eggplant in bowl and cover in a handful of sea salt (this will draw out the moisture and the bitterness) let them sit for 30 mins then rinse well, and pat dry. Toss eggplant in olive oil and fresh cracked pepper and place on a sheet tray. Scatter the tomatoes, spices and garlic. PREP: For wheat berries combine 1/2 cup of w.b. with 1 3/4 cup of water and pinch of salt bring to a boil - then cover and lower heat to a simmer ( about 35-45 mins). For cous cous - place in a glass bowl then boil water and add a small amount (1/3 cup) to the cous cous (cover for 2 mins) fluff the cous cous with a fork and taste to see if it is tender. If there are any grains that have not puffed up and softened add a little more water and do the same. Then add all ingredients together and enjoy! I'm back from my weddingmoon extravaganza. Two weeks in sunny beautiful Mexico flew by and I'm back home in Toronto dreaming about all the fun and delicious days we had. Our wedding group was made up of about 50 something Torontonians and another 10 stragglers from the US of our nearest and dearest friends and family. 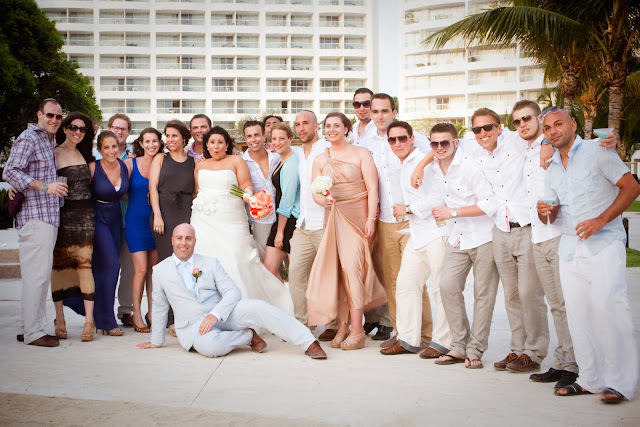 The majority of us stayed at the Dreams Villamagna resort in Nuevo Vallarta - It was a modern all inclusive resort perfect for a large group on a destination wedding. Everyone had a great time relaxing enjoying inexpensive beach massages and an endless supply of mojitos and fish tacos. I have to admit it really was the perfect group of people and everyone got along famously. The wedding was absolutely gorgeous as well! I've decided that over the next little while i'm going to write short and long posts to give you all a sneak peak into our wedding week. There will be a bunch of fabulous ideas on event planning for weddings and other special summer gatherings. I will also post some restaurant reviews and my cooking experience from fantastic vacation home in San Pancho from a super cool local chef Sofia Silva Sanchez . For now I leave you with one of the group photos from the wedding. Chow for now.